One of the most common disagreements between hair consumers and their hairdressers is what actually constitutes a short hairstyle. I think it’s important to note that hairdressers, as a rule, tend to think differently than hair consumers when it comes to length. Which is why it is critical to take images of new short hair styles you want to have created on your own head. Over the years I have come to my own personal ranking scale based on a variety of factors, including my time in cosmetology school and from talking to hairdressers. Of course I have also spent a lot of time over the past ten years categorizing the 24,000+ hairstyle images in the HairBoutique.com Gallery. Often I will ask for multiple opinions because what looks medium to me might look short to someone else. In some cases will categorize a hairstyle in more than one category because it will be right on the borderline between medium and long. Truth be known, medium hairstyles are often harder to spot than clear cut short ones. Not everyone will agree with me regarding my definition of short hair styles but I have decided to share my own terms . 1. Bald/Shaved – No hair whatsoever. This would count as a hairstyle but would it fall into the short range? Hard to say. You be the judge. 2. Buzzed – Super short fuzz with hair lengths measuring in around 1-2″. There is definitely hair covering the head so this would be classified by me as an extremely short hair style. A buzz might result from growing out a shaved scalp or could deliberately be cut this short. I have seen both cases. 3. Short caps or crop hairstyles – The hair covers the entire scalp with more length than the buzzed. The length of the hair would range from the short range of 2″ to a long of 4″ or with hair that barely touches the top of the earlobes. This is classified by me as a very short hair style. 4. Short hairstyles – Coiffed into longer caps, short bobs or layers, this length of hairstyle generally extend sto the middle of the ear or the top of the nose. 5. Medium hairstyles – I classify medium hairstyles as extending from the tip of the nose to just slightly under the chin. Medium hairstyles do not touch the shoulder. Once the hair extends to the shoulders it transitions to long hair. 6. Long hairstyles – Hairstyles that brush the shoulders and extend down to the middle of the back are long. There are different opinions about this but it works well as classifying hair since hair consumers have a different opinion about what constitutes long versus very long or super long. 7. Very long hairstyles – A hairstyle that extends past the middle of the back to the waist is considered by me to be a very long hairstyle. Although the HairBoutique.com Gallery has very few images of hair that is beyond waist length – which is sometimes referred to as Classic Length, hair styles that extend beyond the waist are often classified as thigh length, knee length, calf length, ankle length and floor length. With everything related to hairstyles, there can be many different terms and opinions. The key is to find your own hairstyle definition and live by it. Also, always take images of what you consider the length you want your hairdresser to cut your hairstyle just to be sure. Remember, a photo speaks a thousand words. 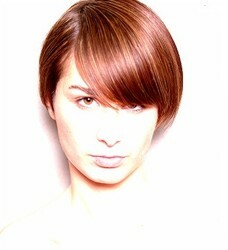 Remember, don’t forget to stop by and visit the HairBoutique.com Hairstyle Gallery with over 24,000 images to examine. If you like, you can also visit our 100% free HairStyle Wizard to try on different hairstyles to determine the hairstyle length that might be best for you. I would to hear your own definition of hairstyle lengths. Please let me know if you have found other lengths of hairstyles that should be included. This entry was posted on Friday, November 14th, 2008 at 6:57 pm	and is filed under Hair, Hairstyles, Short Hair. You can follow any responses to this entry through the RSS 2.0 feed. Both comments and pings are currently closed.